Life and work is more than reading and writing and arithmetic. Being able to function well with others in a wide range of situations is extraordinarily important--for many jobs, at least as important--as explicitly cognitive skills. The Future of Children has devoted is Spring 2017 issue to nine articles about "Social and Emotional Learning." After reading through the articles, my sense is that the subject is of potentially enormous importance, and that the state of current knowledge and practice is fragmented and incomplete, with difficulties in deciding what traits to study, at what ages, and how to measure them. Here are a few snippets. From the the introductory essay by Stephanie M. Jones and Emily J. Doolittle, called "Social and Emotional Learning: Introducing the Issue:"
"Decades’ worth of research suggests that something other than academic skills and content knowledge strongly influences success in school and beyond. Indeed, SEL skills may be just as important as academic or purely cognitive skills for understanding how people succeed in school, college, and careers. In addition, preliminary evidence suggests that SEL skills could be central to understanding and remediating stubbornly persistent gaps in achievement defined by income and racial/ethnic differences. ..."
"Three strategies appear to make interventions more successful, the authors write. First, many effective SEL interventions include training or professional development for early childhood teachers; some also emphasize building teachers’ own SEL skills. Second, effective interventions embed direct instruction and practice of targeted skills into daily activities, giving children repeated opportunities to practice SEL skills in different contexts; it’s best if these activities grow more complex over time. Third, effective interventions engage children’s families, so that kids have a chance to work on their SEL skills both at school and at home. Family components may include teaching adults how to help children build SEL skills or teaching adults themselves how to practice and model such skills. "Are early childhood SEL interventions cost-effective? The short answer is that it’s too soon to be sure. We won’t know how the costs and benefits stack up without further research that follows participants into later childhood and adulthood. In this context, we particularly need to understand how the long-term benefits of shorter, less intensive, and less costly programs compare to the benefits of more intensive and costlier ones." "But evidence from the most rigorous studies of elementary-school SEL programs is ambiguous. Some studies find few or no effects, while others find important and meaningful effects. Or studies find effects for some groups of students but not for others. What causes such variation isn’t clear, making it hard to interpret and act on the evidence. What are the sources of variation in the impacts of SEL programs designed for the elementary years? To find out, Stephanie Jones, Sophie Barnes, Rebecca Bailey, and Emily Doolittle examine how the theories of change behind 11 widely used school-based SEL interventions align with the way those interventions measure outcomes. Their central conclusion is that what appears to be variation in impacts may instead stem from imprecise program targets misaligned with too-general measures of outcomes. That is to say, program evaluations often fail to measure whether students have mastered the precise skills the programs seek to impart." "On the positive side, Yeager finds that effective universal SEL can transform adolescents’ lives for the better. Less encouragingly, typical SEL programs—which directly teach skills and invite participants to rehearse those skills over the course of many classroom lessons—have a poor track record with middle adolescents (roughly age 14 to 17), even though they work well with children. But some programs stand out for their effectiveness with adolescents. Rather than teaching them skills, Yeager finds, effective programs for adolescents focus on mindsets and climate. Harnessing adolescents’ developmental motivations, such programs aim to make them feel respected by adults and peers and offer them the chance to gain status and admiration in the eyes of people whose opinions they value." Those interested in this subject might also look back at my post on "The Economics of Noncognitive Skills" (October 14, 2016). Samuel Taylor Coleridge (1772-1834) is of course most famous for writing poems like "The Rime of the Ancient Mariner" and "Kubla Kahn," as well as hanging around with William Wordsworth and being one of the founders of the Romantic Movement in England, which glorified the emotions of individuals acting in the face of nature or historical settings. Thus, it's not a surprise that Coleridge was no fan of the then-budding discipline of economics, nor of modern commerce. "It is this accursed practice of ever considering only what seems expedient for the occasion, disjoined from all principle or enlarged systems of action, of never listening to the true and unerring impulses of our better nature, which has led the colder-hearted men to the study of political economy, which has turned our Parliament into a real committee of public safety. In it is all power vested; and in a few years we shall either be governed by an aristocracy, or, what is still more likely, by a contemptible democratical oligarchy of glib economists, compared to which the worst form of aristocracy would be a blessing." "Commerce has enriched thousands, it has been the cause of the spread of knowledge and of science, but has it added one particle of happiness or of moral improvement? Has it given us a truer insight into our duties, or tended to revive and sustain in us the better feelings_of_our nature? No! no! when I consider what the consequences have been, when I consider that whole districts of men, who would otherwise have slumbered on in comparatively happy ignorance, are now little less than brutes in their lives, and something worse than brutes in their instincts, I could almost wish that the manufacturing districts were swallowed up as Sodom and Gomorrah." One of the concerns sometimes raised about studying economics is that it tends to make you a more selfish person (for some discussion, see here and here). The great economist John Stuart Mill offered a memorable response to this concern in his "Inaugural Address Delivered to the University of St. Andrews," delivered on February 1, 1867, when he was appointed as Rector of the University (and available various places on the web like here and here, with the address starting on p. 643). I've broken the quotation into two paragraphs here, with most of the wallop arriving in the second paragraph. "Those branches of politics, or of the laws of social life, in which there exists a collection of facts or thoughts sufficiently sifted and methodized to form the beginning of a science, should be taught ex professo [that is, by an expert]. Among the chief of these is Political Economy; the sources and conditions of wealth and material prosperity for aggregate bodies of human beings. This study approaches nearer to the rank of a science, in the sense in which we apply that name to the physical sciences, than anything else connected with politics yet does. I need not enlarge on the important lessons which it affords for the guidance of life, and for the estimation of laws and institutions, or on the necessity of knowing all that it can teach in order to have true views of the course of human affairs, or form plans for their improvement which will stand actual trial. "The same persons who cry down Logic will generally warn you against Political Economy. It is unfeeling, they will tell you. It recognises unpleasant facts. For my part, the most unfeeling thing I know of is the law of gravitation: it breaks the neck of the best and most amiable person without scruple, if he forgets for a single moment to give heed to it. The winds and waves too are very unfeeling. Would you advise those who go to sea to deny the winds and waves—or to make use of them, and find the means of guarding against their dangers? My advice to you is to study the great writers on Political Economy, and hold firmly by whatever in them you find true; and depend upon it that if you are not selfish or hard-hearted already, Political Economy will not make you so." An airline pilot who pays attention to the wind isn't "unfeeling," and neither is a boat captain who pays attention to the water.As economists are quick to note, recognizing the existence of scarcity, budget constraints, and incentives, and thinking about either how best to work within the available constraints or how best to relax those constraints, is not a matter of hard-heartedness. It's a matter of caring enough about the actual problem at hand to face it honestly. Would high school students learn more if school start-times were moved back? For example, the American Association of Pediatrics recommends that adolescents should have schedules that allow them to sleep until 8AM. Jennifer Heissel and Samuel Norris offer some actual evidence on the point in “Rise and Shine: The Effect of School Start Times on Academic Performance from Childhood through Puberty,” Journal of Human Resources, published online before print, April 19, 2017 (the abstract is here, but many readers will have access to the article through an institutional library subscription). "The authors focus their attention on the relationship between sunlight and sleep, and take advantage of the fact that the state of Florida, where they conduct their research, is divided into two time zones. The sun comes up an hour later, on the clock, in the Eastern Time Zone than a few miles west in the Central Time Zone, but schools only partially account for this difference when setting their start times, so, on average, students in the Central Time Zone in Florida have more than half an hour more sunlight before school starts than do their counterparts in the Eastern Time Zone, and some have an hour or more additional sunlight, depending on when school starts. "One might be concerned that people living in different parts of Florida are somehow different in other ways as well, and Heissel and Norris are able to deal with this concern by concentrating on students who moved between time zones, while remaining in the northern part of Florida (typically called the Panhandle). Some students moved between the Eastern Time Zone and the Central Time Zone, thereby gaining extra sunlight in the morning before school, while others moved from the Central Time Zone to the Eastern Time Zone, thereby losing some sunlight before school starts. Their strategy, therefore, is to compare the same students’ test performance before versus after their cross-time zone moves. The authors found that people making these eastward and westward moves in the Florida Panhandle were similar across a large range of characteristics, and tended to follow similar over-time test score trends prior to their moves. "Heissel and Norris carried out a thought exercise in which, for every Florida panhandle school district, they assigned the school district’s earliest start times to elementary students, the middle start times to middle school students, and the latest start times to high school students. This calculation would move elementary school start times 22 minutes earlier, middle school start times 13 minutes earlier, and high school start times 44 minutes later, on average. "Heissel and Norris estimate that making these scheduling switches would raise average math performance by six percent of a standard deviation and average reading performance by four percent of a standard deviation. While not earth-shattering performance changes, they are extremely impressive for a policy change that would cost school districts little to implement – and are approximately one-fourth the difference between an excellent-performing school and an average-performing school." When I've heard discussions of later start times for high school, several issues usually come up. First, there is an aversion to having the youngest children start earlier. Frankly, this has always seemed a little odd to me. I've got no evidence on the point, but a lot of young children seem to wake up pretty early, and parents who are depending on school for child care have good reason to wish that their younger children were out the door a little sooner. Second, there's an argument that if the high school day starts later, it also needs to end later, which in turn means less time for high school sports and activities, or for after-school jobs. Third, there's an argument that lots of high school students are staying up until the middle of the night as it is, and if they can get up later, they will just stay up later. "The American Academy of Pediatrics strongly supports the efforts of school districts to optimize sleep in students and urges high schools and middle schools to aim for start times that allow students the opportunity to achieve optimal levels of sleep (8.5–9.5 hours) ..." But of course, getting a sufficient quantity of sleep is not just about school start times. It's about the outside-school load of homework, school activities, jobs, family life, social life--and about developing a habit where the regular bedtime is a hour or more before midnight, not after. "I want you to imagine a small, rural town somewhere in the desert southwest. This little town is modest and utterly unremarkable in every way. But in the center of town, clustered around the only stoplight, are three gas stations. These three stations have the only gas for sale within 150 miles in every direction. The date is 1970, so this is a time with no internet, no personal computers, no cell phones, and certainly no algorithmic pricing. All three gas stations currently charge exactly the same price for a gallon of gas. Prices may go up and down as the wholesale price of gasoline moves, but all three stations generally charge identical prices, and have been charging essentially identical prices for years. "All of that is about to change. At 6:00AM one bright clear Monday morning, the owner of the first gas station gets out his ladder and leans it against the big price sign out front. He then climbs up the ladder and changes the price, making it five cents a gallon more expensive. Then he takes his ladder down, walks over to a lawn chair in the shade and sits down to have a cup of coffee. At 10:00AM, he gets the ladder back out and lowers his price back down five cents so his price is now the same as everybody else’s price. He repeats that same pattern of behavior every Monday morning. He never directly talks to his competitors about the prices he is charging or why he is doing what he did. "Has he violated the antitrust laws just by changing his price for four hours? If that is all he has done, the answer is no. Generally, firms are free to set whatever prices they choose, as long as they act independently. Nor would it be unlawful for one of the other gas stations to decide, on his own, to follow the lead of our analog-era friend with the ladder and start raising his own prices on Monday mornings. Even if all the stations in the town ultimately decide to follow the lead of the first station and raise prices five cents, then keep those high prices in place, the antitrust laws do not condemn this behavior. "So why don’t we enforcers take action in this situation to prevent conscious parallelism? The simple reason is that there is no sensible remedy here. In a free market, individual actors are free to set their prices on the basis of all the information legally available to them. It is axiomatic that we cannot tell firms to ignore the public behavior of their rivals when they set prices without deleting the “free” in free market. Enjoining this kind of behavior would inevitably lead to price regulation, which is completely inimical to the underlying purposes of the antitrust laws. Because we cannot police this sort of behavior directly, instead we try to make sure, primarily through our merger enforcement program, that the conditions that allow this kind of behavior to take place generally don’t arise in the first place. We also prohibit explicit agreements to set prices collusively and exchanges of competitively sensitive, non-public information between competitors. "Fortunately for all of us, there are many, many reasons why this kind of informal pricing interdependency frequently fails or breaks down in the real world. For example, when the products are highly differentiated, or the market participants have different cost structures, or transactions are relatively infrequent, it is very difficult to maintain stable, interdependent pricing just by watching the behavior of your rivals. So the specific facts of my gas station example are very important. "So while our friend with the ladder may eventually, informally lead everyone’s prices higher, things look a lot different from a legal perspective if he walks over to one of his competitors and starts talking to him about prices. Suddenly we now have conduct that has nothing to do with independently setting prices and reacting to market conditions. The policy considerations that tolerate unilateral but interdependent pricing no longer apply. Once competitors reach an agreement setting price or output, they are engaged in behavior with no social utility and an enforcement response by the government is warranted. So there is a critical legal difference between concerted behavior among competitors aimed at influencing prices and unilateral decision-making in light of observed market conditions. Setting prices together is illegal, while observing the market and making independent decisions is not." Ohlhausen uses the small-town gas station example to argue that the issues raised by algorithmic pricing are reasonably familiar, that similar issues have come up in well-known cases in the past, and so the antitrust authorities will have power to act if needed. For example, one concern about algorithmic pricing is that the players in the market may use it as a way of colluding with each other behind the scenes, in a way that isn't easily visible in market prices. Ohlhausen points out that more than 20 years ago, back in 1993, airlines were using the information on-line reservation systems as a way of limiting competition, but the antitrust authorities and the courts had no trouble understanding the problem and addressing it. She writes: "This is because the type of technology used to communicate with competitors is wholly irrelevant to the legal analysis. Whether it is phone calls, text messages, algorithms or Morse code, the underlying legal rule is the same – agreements to set prices among competitors are always unlawful." 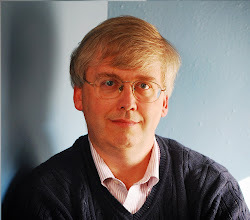 Ohlhausen proposes the "guy named Bob" rule: " "Everywhere the word `algorithm' appears, please just insert the words `a guy named Bob'. ... If it isn’t ok for a guy named Bob to do it, then it probably isn’t ok for an algorithm to do it either." My sense is that Ohlhausen is surely correct about the underlying law here: that is, doing something with an algorithm does not offer any protection or immunity against antitrust rules. I also like the small-town gas station metaphor and the "guy named Bob" rule, as nice concrete ways of illustrating these issues. But I do worry that while algorithmic pricing doesn't alter the rules of antitrust, it may make collusion easier. As one example, a few years back there was a scandal about the LIBOR benchmark interest rate (that is, London Interbank Offered Rate). The rate was set by having a number of big banks send in the interest rates they were being charged for borrowing. But it turned out that the individual actually submitting the rates were not sending actual numbers, but instead shading them up or down. As a result, the LIBOR would be a little higher or lower than it should have been. The effect was only a small amount for a short time, but LIBOR is linked to something like $300 trillion of financial instruments around the world, so a trader who knew that the rate was artificially high or low could find a way to cash in. This manipulation went on for years, and led to prosecutions at 15 major global financial institutions. Yes, this particular case was eventually detected and prosecuted. But having algorithms ready to pounce on small and short-term movements in LIBOR clearly helped to facilitate the entire scheme. One wonders about the possibility of other cases, perhaps using market benchmarks or interest rates that are less prominent than LIBOR and involving far fewer participants, which are not detected. The problem here is not specifically algorithms, but rather that the internet offers lots of possibilities for those who wish to collude, and algorithms can make it easier to cash in on such collusion. There are other cases where the algorithms themselves may become problematic. Algorithms are starting to offer the possibility of "personalized pricing," which refers to presenting online shoppers with a carefully designed series of options and prices and "if-you-buy-now" sales that--in combination with their past buying patterns and well-known behavioral biases--push that person toward a certain choice. In other cases, as we move deeper into the world of big data and artificial intelligence, algorithms for buying and selling and setting prices are increasingly moving beyond basic rules, like buying only when a price falls below a certain level. Algorithms are now analyzing past patterns of players in the market, including how those player have reacted in the past, and then planning and implementing a potentially multi-step strategy. My guess is that some point there will be an antitrust case featuring the "algorithm defense," which basically says: "Hey, I just set up the smart learning algorithm and let it run. How could I know that it would interact with other smart learning algorithms in a way that led to collusion?" And the antitrust authorities (or other law enforcement) will need to argue that when a guy named Bob sets up and signs off on an algorithm, Bob needs to be personally responsible for what that algorithm does. "In particular, we have shown how the very fast growth in cross-border positions in relation to global GDP has come to a halt since the financial crisis, reflecting both a retrenchment of cross-border banking activity and the increased weight of less-financially-integrated emerging and developing economies in global GDP. 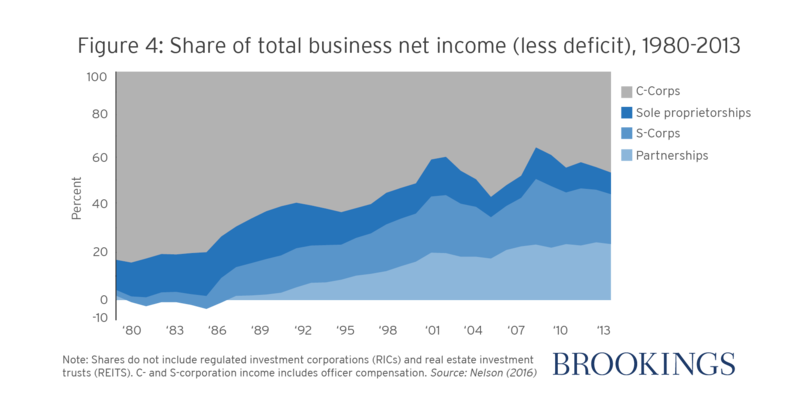 Across country groups, we have documented the disproportionate role played by financial centers—both small offshore centers and a few larger advanced economies—in total holdings, as well as the growing but still relatively modest role played by emerging and developing economies. Across financial instruments we have shown how the retrenchment in cross-border banking activity and the much more modest increase in portfolio positions relative to pre-crisis trends has been offset by rapidly increasing FDI [foreign direct investment] positions. 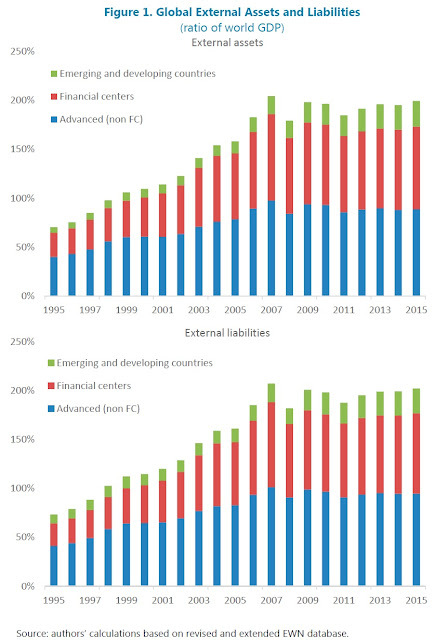 These have reflected to an important extent claims on and from financial centers, where pass-through financial vehicles as well as the shifting domiciles of multinationals have played a crucial role." Cayman Islands)." The authors note of these financial centers that "as of 2007, these accounted for close to 10 percent of world GDP but over 43 percent of global financial assets. By 2015, their share in world GDP had declined to 8 percent, but their global share of external assets remained around 43 percent." extensive cross-border activities, other factors play an important role in explaining both the size and composition of FDI claims and liabilities as well as their dynamics. The first is the growing importance of Special Purpose Entities. These are legal entities with “little or no employment; or operations, or physical presence in the jurisdiction in which they are created by their parent enterprises which are typically located in other jurisdictions (economies)” (OECD, 2008). Such vehicles are used to raise capital or hold assets/liabilities and generally perform no production activities. Statistics on the relative importance of SPEs in total FDI are only available for a limited set of countries. Helpfully, those include the Netherlands and Luxembourg, which are the countries with the largest stocks of FDI claims and liabilities after the United States. The vast majority of their FDI claims and liabilities (over ¾ for the Netherlands and over 90 percent for Luxembourg) are indeed SPEs. Total FDI claims by SPEs for just these two countries have grown by over $3.5 trillion between 2007 and 2014—over ¼ of the increase in the stock of global FDI claims during the same period. increase the stock of global FDI (think for instance of a U.S. pharmaceutical company with important local production facilities moving its headquarters to Ireland). In that case, global FDI would increase by the value of the U.S. production facilities minus the value of any facility previously located in Ireland. Indeed, the stock of FDI claims overseas by Ireland has increased by $600 billion between 2007 and 2014, and by that date it is over 5 times Irish GDP. The counterpart to an increase in FDI assets in the countries hosting re-domiciled firms is a matching increase in foreign portfolio equity liabilities, given that the underlying shareholders of the entities remain the same. My own interpretation of these patterns is that the kind of foreign direct investment which involves a company taking real management interest in running a firm elsewhere, and which often involves transfers of skill and technology, may well be in decline. However, the kind of foreign direct investment that involves setting up foreign headquarters and foreign financial vehicles as a way of pushing back against tax and regulatory issues is on the rise. Meat, and especially beef, has a heavy environment footprint by the time you take into account the farm products and land needed to produce it. In particular, if one looks out at the emerging and not-yet-emerging markets across the global economy, and start calculating what kinds of farm output would be needed for a large share of the world to have the meat consumption of high-income countries, it's hard to see how it would work. However, there are ongoing efforts to think about how one might increase world production of protein with a smaller environmental footprint. For example, I've written before about "First Burger Grown from Stem Cells Served in London" (January 21, 2014). 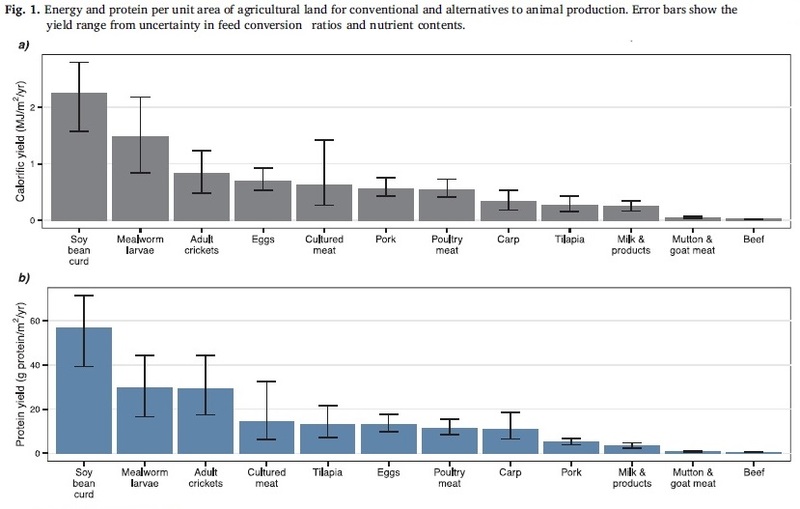 In "Tradeoffs of Cultured Meat Production" (May 16, 2016), I pointed to some studies suggesting that "carneries"--that is, factories that produce meat--could have a much smaller effect on land use and associated environmental costs than traditional meat production. Here's an illustrative figure from the paper. The top panel shows calories per unit of agricultural land; the bottom panel shows protein per unit of agricultural land. On both measured, beef is the lowest producer on the far right-hand side. The most efficient producer in both cases is soybean curd, followed by mealworm larvae and adult crickets. Cultured meat is in the middle of the pack, not too different from eggs, poultry, and pork. As the authors note (citations omitted): "The results here assume that insect feed uses the same mix of feeds currently used for conventional livestock. However, if half of food discarded by consumers could be used as feed for mealworms, this would replace 8.1% of current animal production." From a US perspective, mealworms and crickets may not sound like culturally acceptable alternatives. But there are lots of places around the world where demand for calories and protein is rising sharply, and where eating insects or worms is, if not always common, by no means taboo, either. Perhaps more to the point, after a certain amount of processing, protein from mealworms or crickets may not look or taste all that different from the mystery meat that already shows up in a number of places. Nuggets are nuggets, right? 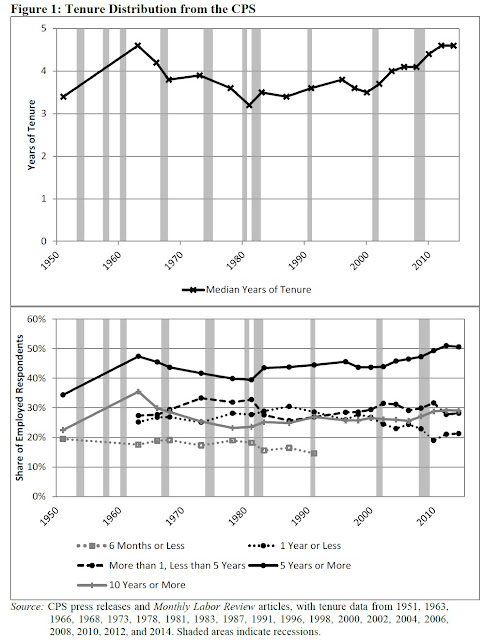 "According to published statistics from the Current Population Survey (CPS), the proportion of workers with five or more years of tenure on their main job has increased from 44% to 51% from 1998 to 2014, and the proportion of workers with one year or less of tenure on their main job has decreased from 28% to 21%. 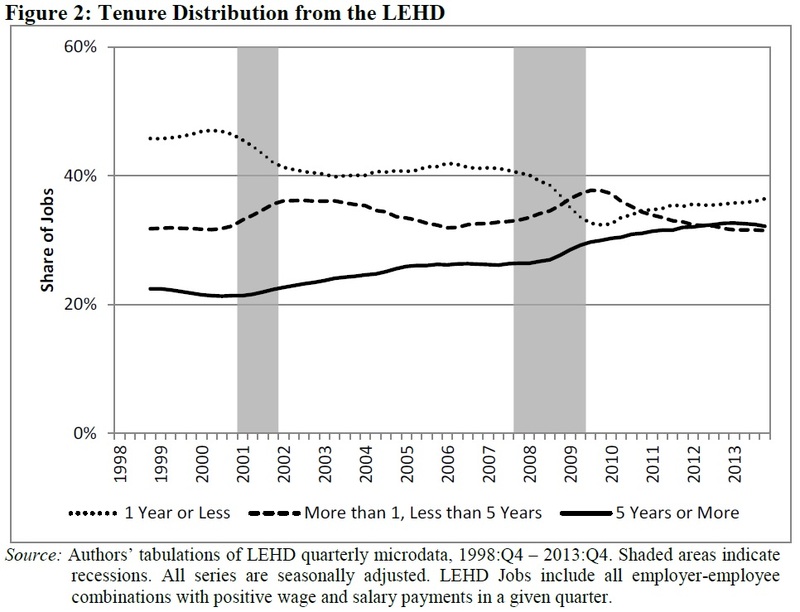 We document a similar shift in the job tenure distribution for the years 1998 to 2013 using LEHD [Longitudinal Employer-Household Dynamics] microdata, which is nearly identical to the CPS tenure distribution once differences between these source data are accounted for." Here are a couple of illustrative figures. The top panel shows median job tenure in the Current Population Survey data, going back to 1951. The bottom panel shows the share of jobs that fall into certain job tenure categories: for example, the top line shows the share of employed people who have held a job for at least five years. 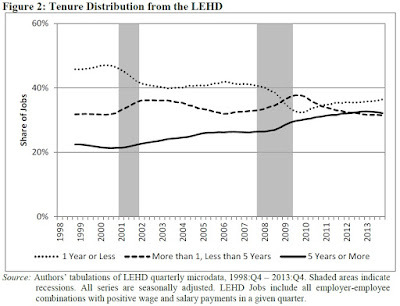 Here's a figure based on the Longitudinal Employer-Household Dynamics data, which is a database in which state governments send administrative records about who works where to the US Census Bureau, which combines them in a way that preserves anonymity for workers and employers. The database covers 95% of private sector jobs. Again, you can see the rise in the share of jobs held for more than five years. What's going on behind these numbers? 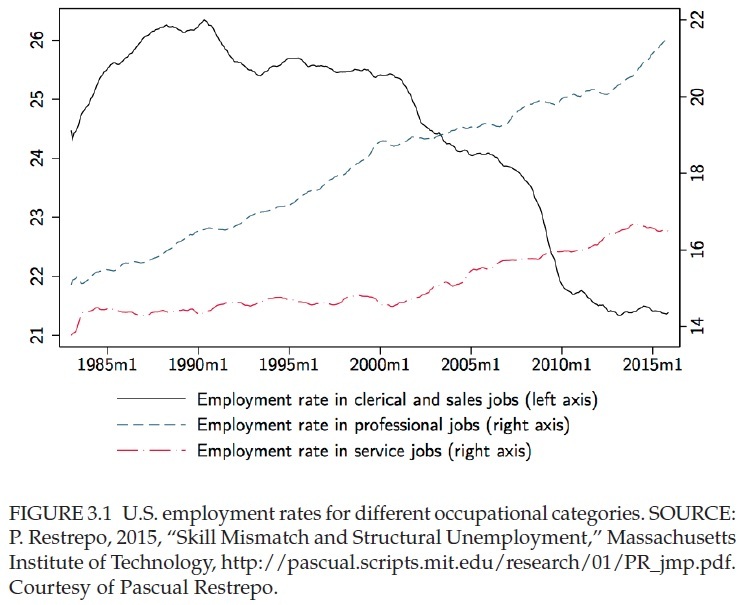 Hyatt and Spletzer forthrightly answer: "While there is ample evidence that the labor market is shifting toward more stable jobs, the causes and consequences of declining dynamics and increasing stability remain unknown." But they do massage the data in way that offers some clues. For example, they note that older workers tend to have stayed at their jobs longer, and the US workforce is getting older. So they ask: To what extent does the rise in job tenure just reflect an older workforce? Or they note that the US economy has been experiencing a slowdown in the start-up rate of new companies for about 20 years now, so more workers are with older firms. Again, to what extent does the rise in job tenure reflect the the fact that US firms are older? The answers to these questions vary with whether they are using Census or LEHD data, but in rough terms, the older workforce can explain about one-third of the rise in job tenure and the growing age of firms can explain about one-sixth of the change, but about half of the rise in job tenure is not explained by the factors they are able to consider. There is a knee-jerk temptation to feel as if longer job tenure is likely to be a good thing--more stability for workers. But there are tradeoffs. 1) To the extent that longer job tenure is being driven by fewer start-ups and a smaller share of the US workforce being employed at new firms, it is clearly a mixed blessing. 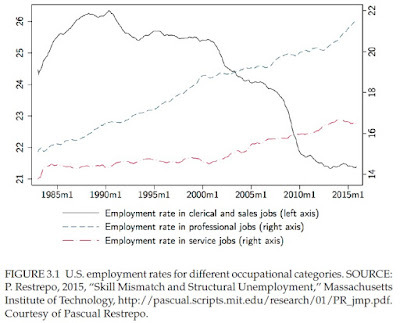 2)The US labor market "churns," as economists sometimes say. There are always millions of people separating from jobs and being hired for new jobs. In good times, the new jobs outnumber the separations; in bad times, it's the reverse. But along with the lower rate of start-up companies, the US labor market has been less showing less churn in the last 15-20 years. 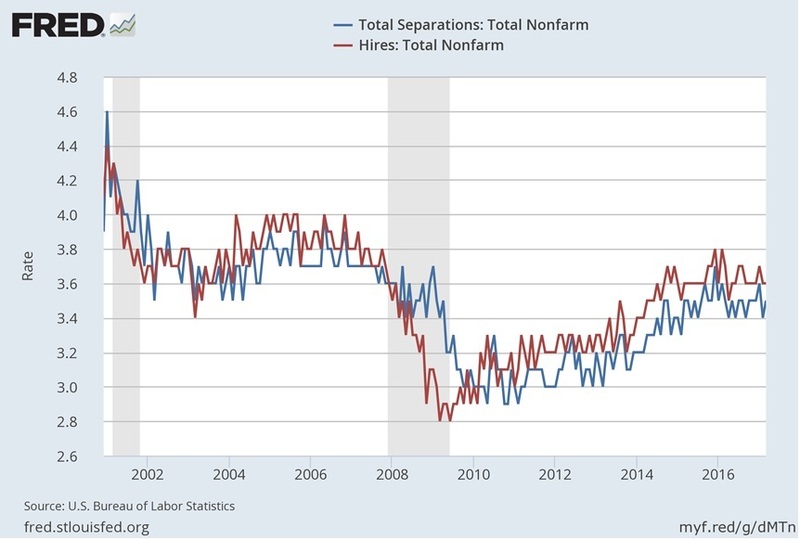 Both rates of hiring and of separation rates dropped off for the first decade of the 2000s, although they have rebounded a bit since then. 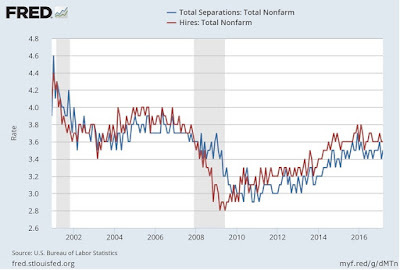 Of course, some of the reason that job separation rates fell around 2007 is that, in a weak economy, workers have a greater tendency to hold on to the job they've got. In addition, jobs where someone has just been hired are on average shorter-term, and so the drop in the hiring rate seems linked to longer job tenure. But of course, a less flexible job market with lower hiring rates is a mixed blessing, too. 3) The job tenure calculations are based on workers with jobs. Thus, a worker who is unemployed for a time and then returns to the workforce in a new job will tend to reduce job tenure. But there has also been a decline in the US labor force participation rate--that is, a greater number of adults who don't have jobs and aren't looking for a job. I suspect that if some of of these people had stayed in the labor force, they might have been more likely to be moving in and out of various jobs, which would have pulled down the average job tenure. 4) One benefit of longer job tenure is that workers develop experience and skills which make them a good "match" for their employers, and thus enable them to get wage increases. But at least in the last 10 years or so, "The increase in average real earnings since 2007 is less than what would be predicted by the shift toward longer-tenure jobs because of declines in tenure-held-constant real earnings. Regression estimates of the returns to job tenure provide no evidence that the shift in the job tenure distribution is being driven by better matches between workers and employers." Of course, earnings after about 2007 are sharply affected by the Great Recession. But overall, the picture that emerges is that job tenure rates aren't up because of workers who are more productively matched to stable jobs. Instead, job tenure rates are up from a combination of a less dynamic economy and a less fluid labor market, combined with a Great Recession that caused more workers to cling to the job they had. "Many of us consider it possible that the process of exchange requires or at least is greatly facilitated by the presence of several of these virtues (not only truth, but also trust, loyalty, and justice in future dealings). Now virtue may not always be its own reward, but in any case it is not usually bought and paid for at market rates. In short, the supply of a commodity in many respects complementary to those usually thought of as economic goods is not itself accomplished in the marketplace ... Virtually every commercial transaction has within itself an element of trust, certainly any transaction conducted over a period of time. It can be plausibly argued that much of the economic backwardness in the world can be explained by the lack of mutual confidence ... "
"Americans of all ages, all conditions, and all dispositions, constantly form associations. They have not only commercial and manufacturing companies, in which all take part, but associations of a thousand other kinds—religious, moral, serious, futile, extensive, or restricted, enormous or diminutive. The Americans make associations to give entertainments, to found establishments for education, to build inns, to construct churches, to diffuse books, to send missionaries to the antipodes; and in this manner they found hospitals, prisons, and schools. ... Nothing, in my opinion, is more deserving of our attention than the intellectual and moral associations of America. The political and industrial associations of that country strike us forcibly; but the others elude our observation, or if we discover them, we understand them imperfectly, because we have hardly ever seen anything of the kind. It must, however, be acknowledged that they are as necessary to the American people as the former, and perhaps more so. In democratic countries the science of association is the mother of science; the progress of all the rest depends upon the progress it has made." But while the idea that social capital is important is far from new, it's nonetheless interesting that the staff of the Joint Economic Committee of Congress has just published a report "What We Do Together: The State of Associational Life in America (Social Capital Project Report 01-17, May 2017). It's studded with quotations from authors like Tocqueville and Robert "Bowling Alone" Putnam. Before listing some facts about changes in what the report calls "associational life" in America, it's perhaps useful for me to confess that while I can easily believe that social capital is generally important, the specific processes by which it is created and reinforced are not clear to me. It would be peculiar and anachronistic to yearn after the good old days of 1840. If the people of 1840 had radio, television, and the internet, not to mention the ability to hop in a car or a plane and travel, then the "associations" observed by Tocqueville would have looked rather different. The question of what social institutions are most useful to inculcate the growth of a citizens with a predisposition to cooperation and trust is a vast ocean, and I am just a guy in dinghy, padding around with one small oar. Between 1973 and 2016, the percentage of Americans age 18-64 who lived with a relative declined from 92 percent to 79 percent. The decline was driven by a dramatic 21-point drop in the percentage who were living with a spouse, from 71 percent to 50 percent. In 1970, there were 76.5 marriages per 1,000 unmarried women aged 15 and older. As of 2015, that rate had declined by more than half to 32 per thousand. In 1970, 56 percent of American families included at least one child, but by 2016 just 42 percent did. The average family with children had 2.3 children in 1970 but just 1.9 in 2016. Among all families—with or without children—the average number of children per family has dropped from 1.3 to 0.8. In the early 1970s, nearly seven in ten adults in America were still members of a church or synagogue. While fewer Americans attended religious service regularly, 50 to 57 percent did so at least once per month. Today, just 55 percent of adults are members of a church or synagogue, while just 42 to 44 percent attend religious service at least monthly. In the early 1970s, 98 percent of adults had been raised in a religion, and just 5 percent reported no religious preference. Today, however, the share of adults who report having been raised in a religion is down to 91 percent, and 18 to 22 percent of adults report no religious preference. Between 1974 and 2016, the percent of adults who said they spend a social evening with a neighbor at least several times a week fell from 30 percent to 19 percent. Between 1970 and the early 2010s, the share of families in large metropolitan areas who lived in middle-income neighborhoods declined from 65 percent to 40 percent. Over that same time period the share of families living in poor neighborhoods rose from 19 percent to 30 percent, and those living in affluent neighborhoods rose from 17 percent to 30 percent. Between 1972 and 2016, the share of adults who thought most people could be trusted declined from 46 percent to 31 percent. Between 1974 and 2016, the number of Americans expressing a great deal or fair amount of trust in the judgement of the American people “under our democratic system about the issues facing our country” fell from 83 percent to 56 percent. Between 1974 and 2015, the share of adults that did any volunteering who reported volunteering for at least 100 hours increased from 28 percent to 34 percent. • Between 1972 and 2012, the share of the voting-age population that was registered to vote fell from 72 percent to 65 percent, and the trend was similar for the nonpresidential election years of 1974 and 2014. Correspondingly, between 1972 and 2012, voting rates fell from 63 percent to 57 percent (and fell from 1974 to 2014). • Between 1972 and 2008, the share of people saying they follow “what’s going on in government and public affairs” declined from 36 percent to 26 percent. • Between 1972 and 2012, the share of Americans who tried to persuade someone else to vote a particular way increased from 32 percent to 40 percent. • Between the mid-1970s and 2012, the average amount of time Americans between the ages of 25 and 54 spent with their coworkers outside the workplace fell from about two-and-a-half hours to just under one hour. • Work has become rarer, in particular, among men with less education. From the mid-1970s to 2012, hours at work fell by just 2 percent among men with a college degree or an advanced degree, compared with 14 percent among those with no more than a high school education. • Between 1995 and 2015, workers in “alternative work arrangements” (e.g., temp jobs, independent contracting, etc.) grew from 9 percent to 16 percent of the workforce. • Since 2004, median job tenure has been higher than its 1973 level, indicating that workers are staying in their jobs longer than in the past. • Between 1970 and 2015, union membership declined from about 27 percent to 11 percent of all wage and salary workers. (the Project Gutenberg edition). Toward the end of the excerpt, in particular, Tocqueville argues that freedom of association in political, civic, and economic interactions is all intertwined: when people learn how to form associations, it spreads across these varied contexts. Is it enough to observe these things separately, or should we not discover the hidden tie which connects them? In their political associations, the Americans of all conditions, minds, and ages, daily acquire a general taste for association, and grow accustomed to the use of it. There they meet together in large numbers, they converse, they listen to each other, and they are mutually stimulated to all sorts of undertakings. They afterwards transfer to civil life the notions they have thus acquired, and make them subservient to a thousand purposes. Thus it is by the enjoyment of a dangerous freedom that the Americans learn the art of rendering the dangers of freedom less formidable. In 2015, the US spent $328 billion on retail drugs, and another $129 billion on "non-retail" drugs, which are the drugs purchased by hospitals, nursing homes, and other health care providers and added to your bill. The operation of the market for prescription drugs is a tangle, in ways that suggest competition is often being hindered--or even throttled. in the United States,' which appears in the May 15, 2017 issue of the Journal of the American Medical Association (pp. E1-E2). The manufacturers of prescription drugs are at the center top of the figure. The drugs themselves work down the left-hand-side of the figure, through distributors and retailers, before reaching the patients. 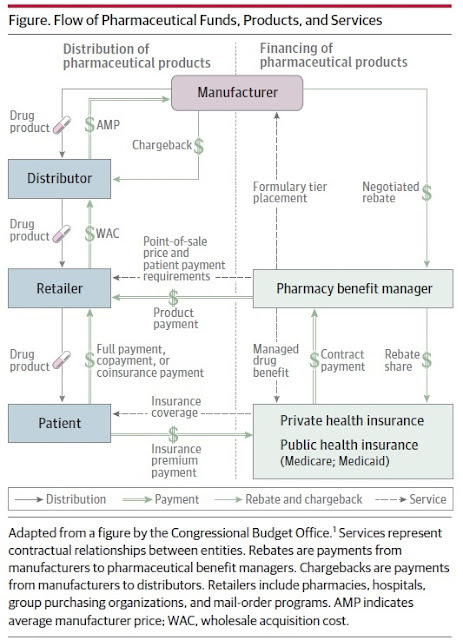 The various arrows in the center and right of the diagram show flows of payments, including AMP (Average Manufacturer Price), WAC (Wholesale Acquisition Cost), and then a maze of chargebacks, negotiated rebates, and payments from patients and private and public health insurance, often mediated through "pharmacy benefit managers." "In 2015, an estimated 4.4 billion drug prescriptions were dispensed in the United States ... There are approximately 60 000 pharmacies in the United States, of which 38 000 are part of retail chains and 22 000 are independent pharmacies. The retail pharmacy market can be divided into 3 major categories: chain pharmacies and mass merchants with pharmacies, independent pharmacies, and mail-order pharmacies. The 15 largest firms, including CVS, Walgreens, Express Scripts, and Walmart, generated more than $270 billion in revenue in 2015 through retail and mail-order pharmacy, representing approximately 74% of retail prescription revenues. "PBMs [pharmacy benefit managers] developed in the 1980s as employers added outpatient prescription drug coverage to their health insurance plans. By 2015, industry consolidation had resulted in 3 PBMs—CVS Caremark, Express Scripts, and UnitedHealth’s Optum—controlling a 73% share of the PBM market. "Health insurance generally includes prescription drug insurance in both public and private health insurance plans. In 2015, 42%of prescription drug spending was from private health insurance, 30% from Medicare, 10% from Medicaid, and 14% from private out-of-pocket payments. 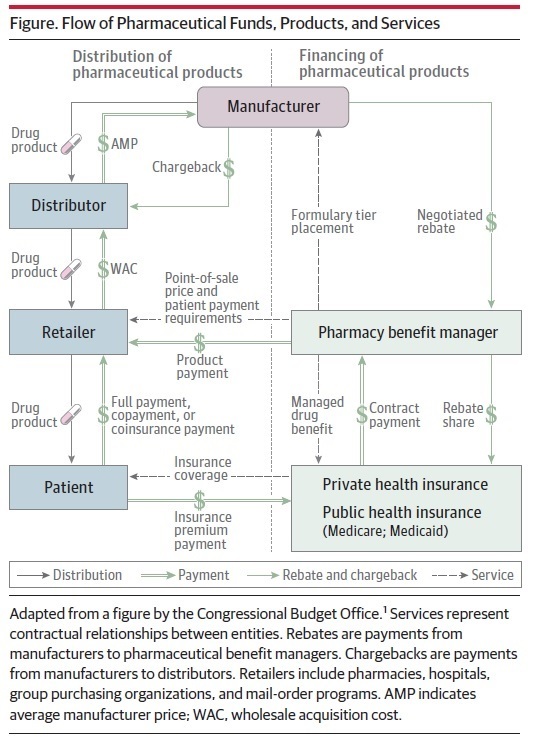 "In addition to the usual product discounts and allowances for product returns, manufacturers provide a series of cash payments to health plans, PBMs, and distributors in the form of rebates and chargebacks as a result of complex pricing arrangements across the industry. The end result of these complex transactions is that in 2015, $115 billion, or 27% of total pharmaceutical sales,was paid by manufacturers to various entities throughout the drug distribution and financing systems. 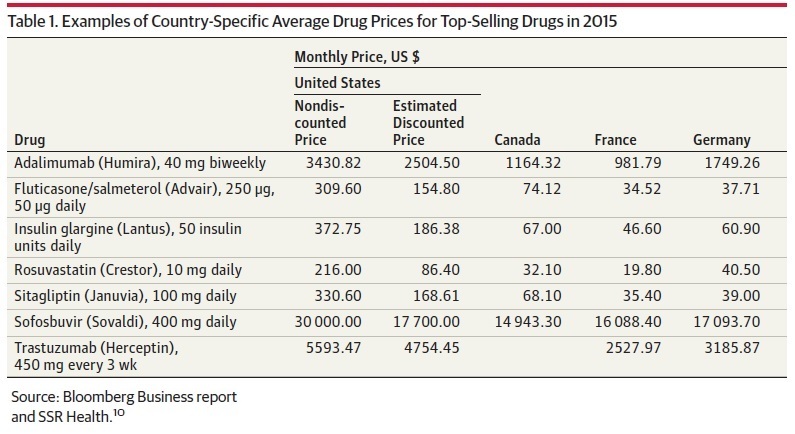 1) Prices are rising for brand-name drugs, and competition between brand-name drugs doesn't seem to bring down prices. "In practice, however, competition between 2 or more brandname manufacturers selling drugs in the same class does not usually result in substantial price reductions. For example, of the 8 cholesterol-lowering statins that the FDA has approved, 2 have until recently remained patented: rosuvastatin (Crestor) and pitavastatin (Livalo). Despite the similar performance of these drugs in decreasing low-density lipoprotein cholesterol to other off-patent statins, the price of rosuvastatin increased 91% between 2007 and 2012, from $112 to $214 per prescription. During the same time, the price of the comparably effective atorvastatin decreased from $127 to $26 per prescription owing to the expiration of its patent protection in 2011. Similar effects have been observed for other drug classes." 2) While competition from generic drugs often does help to bring down prices, that competition faces a number of limits. Brand-name manufacturers often find ways to push back competition from generics, and when a generic for a relatively rare condition has a monopoly, the price for the generic skyrockets, too. "Entry of generic drugs into the market, however, is often delayed. For pharmaceutical manufacturers, “product life-cycle management” involves preventing generic competition and maintaining high prices by extending a drug’s market exclusivity. This can be achieved by obtaining additional patents on other aspects of a drug, including its coating, salt moiety, formulation, and method of administration. ... For their part, generic manufacturers have engaged in litigation with brand-name manufacturers that could lead to the patents being invalidated, but these suits are frequently settled. Historically, brand-name manufacturers have offered substantial financial inducements as part of these settlements to generic manufacturers to delay or even abort generic introduction. Settlements involving large cash transfers are called “pay for delay”; for example, in a patent challenge case related to the antibiotic ciprofloxacin (Cipro), the potential generic manufacturer received upfront and quarterly payments totaling $398 million as part of the settlement and agreed to wait until patent expiration to market its product. 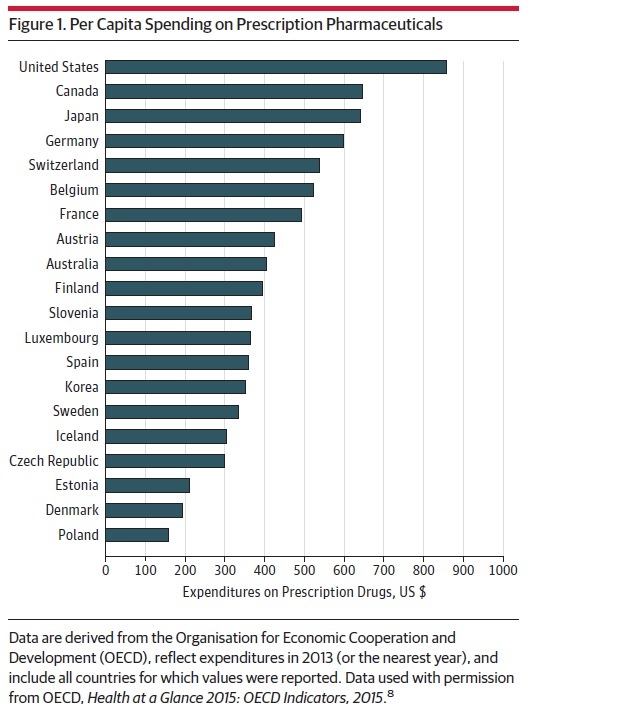 "Although brand-name drugs account for the greatest increase in prescription drug expenditures, another area that has captured the attention of the public and of policy makers has been the sharp increase in the costs of some older generic drugs. In 2015, Turing Pharmaceuticals raised the price of pyrimethamine (Daraprim), a 63-year-old treatment for toxoplasmosis, by 5500%, from $13.50 to $750 a pill. The company was able to set the high price despite the absence of any patent protection because no other competing manufacturer was licensed to market the drug in the United States. 3) The big government purchasers of drugs, Medicare and Medicaid face legislative limits in encouraging or requiring the purchase of cheaper drugs or generic drugs. "Similarly, state Medicaid programs are generally required by law to cover all FDA-approved drugs, even if a particular medication has alternatives that are safer, are more effective, or offer greater economic value. However, Medicaid is also entitled to receive a rebate of at least 23.1%of the average manufacturer price for most branded medications and is protected from price increases exceeding inflation. 4) Prescription benefit managers are typically paid according to the total revenues of the drugs they manage, and thus lack a strong incentive to negotiate for lower prices. "In the 1990s, prescription benefit management companies became prominent intermediaries whose role would be to help employers or insurers promote appropriate prescription drug use and decrease its cost. There have been some recent isolated examples in which pharmacy benefit managers have doneso for specific drugs (most prominently for drugs treating hepatitis C or the pro-protein convertase subtilisin/kexin type 9 inhibitors to reduce cholesterol levels). However, aggressive price negotiation is not the norm. This is not surprising because part of pharmacy benefit managers’ annual fees are based on a given payer’s spending on drugs. Although the details of such payments are rarely disclosed, when one of the largest pharmacy benefit managers became a publicly traded entity, it was obliged to disclose its business model, much of which depended on payments from drug makers for shifting market share to their products from others in its class." 5) State-level laws also tend to protect brand-name drugs by hindering competition from generics. "Notwithstanding high generic drug use rates, problems at the state level can diminish the capacity of generic drugs to help contain costs. Thirty states have drug product selection laws that allow but do not require pharmacists to perform generic substitution; in 26 states, pharmacists must secure patient consent before substituting a generic version of the same molecule. The latter obligation was estimated to have cost Medicaid $19.8 million in 2006 for simvastatin (Zocor) alone. In addition, all states allow physicians to issue dispense-as-written prescriptions that pharmacists cannot substitute with a generic product, further contributing to hundreds of millions of dollars in spending on branded drugs for which generic versions are available." 6) Large self-insured employers have traditionally felt that the potential cost savings from negotiating hard over drug prices, or pushing for alternative and cheaper drugs, wasn't worth the risk of bad public relations episode. care budgets, the organizational concern that could be caused by denying payment to an employee or retiree for a particular drug was seen as overwhelming the modest savings that could be realized. 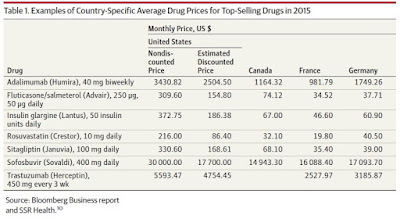 This may change as drug prices increase, particularly for widely used products, and as drug spending consumes a greater share of health budgets." Overall, the consequences of this lack of competition contribute to high and rising prescription drug prices. One tradeoff is less money in household and government budgets to spend on other priorities. Another tradeoff is that people facing high drug costs become less likely to take the drugs on time and in full, which leads to preventable health problems. There is also a potential tradeoff between cheaper drugs today and incentives for innovation leading to the new and improved drugs for the future. There are a variety of ways to provide additional incentives for innovation, including more government support or tax incentives for R&D, and reform of the Food and Drug Administration protocols so that testing and bringing a new drug to market is not so difficult and costly. In comparison, having drug companies that seek out generic drugs where they can be the sole producer and then jack up the price doesn't seem an especially useful incentive. There's an solid economic case for patents and intellectual property, which offer some protection from competition, but whether it's drugs or some other product, the case for patents doesn't imply that the remaining competitive forces should be stripped out of broad areas of the market.